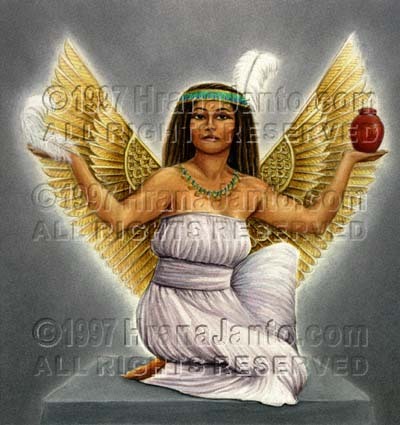 I painted Maat in 1996 for The Goddess Oracle. The Egyptian goddess of truth, she took the form of an ostrich feather on the underworld balancing scales, opposite a recently dead person's heart. If the dishes balanced-if the heart of the deceased was light with justice-the judge, Osiris, said, "Let the deceased depart victorious. Let him go wherever he wishes to mingle freely with the gods and spirits of the dead." Alas for the soul if the dishes did not balance, for the heart heavy with evil was instantly eaten by the monstrous goddess Ahemait. Sometimes divided into two identical goddesses, Maat had no temples but was worshiped in the rhythm of truth, wherever it was perceived.